click on this picture to enlarge! 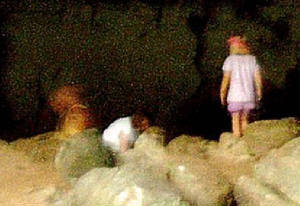 Hi my name is Curtis, my sister-in-law showed me some pictures that she and my brother had taken with their digital camera on a family outing to some Native American caves by the Buffalo River in northern Arkansas, which appeared to have some extra occupants. She had the pictures stored on her laptop with no intention of doing anything with them other than entertaining anyone that would listen to her stories. I thought that someone needed to see this photo that I have attached. This has got to be one of the freakiest pictures that I have seen. The figure to the left clearly appears to be a little demon with the most sinister looking grins on his face, wearing some kind pointy looking hat... Almost as though he turned to pose for the photo. My sister-in-law had some kind of story about him being some kind of mischief devil or something, but I just felt that it is too clear of a picture to not be examined. My brother and sister-in-law are not technologically capable, and that is not because they live in Arkansas, they just don't think that they need it. So I am certain that this is the original untouched photo. If you would take a look at the picture and let me know what you think, I would certainly appreciate your time. Thank you guys and I enjoyed your site. Thank you Curtis for sending us this photo. We have analyzed this picture and have come to the following conclusions. This picture appears to be genuine and not fake. 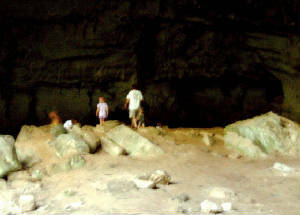 The object at the left is not something added later and was in the photo when it was taken. While we cannot say for sure what that is, we can say what it is not. 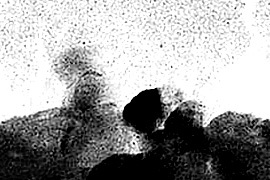 It is not glare or refraction from the sun, the object is behind a rock and in front of the back wall. Having the family in the photo gives us an idea of the size, but it's shape does not match that of any animal I know of. 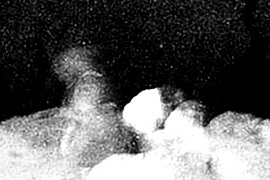 It appears to have a "face" and possibly a hat or something on its head, but that might just be the movement of it when it turned to the camera. The color of it does not match any of the rocks or objects in the photo and it is distinctly transparent to a degree. It is not human, although you can see what appears to be eyes, a nose and a mouth, but none of these look human. THere is also a white object at its neck which has very clear lines and does not match any of the rocks behind it. While I cannot say absolutley what this is, it is certainly something not normal. 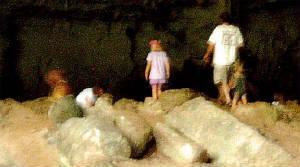 Several pictures taken in a row would be needed to absolutely define what this might be, however I believe if this is indeed the unaltered original, then Curtis' sister-in-law and brother stumbled onto something paranormal in the native-american caves. One of the tests was to remove the color from this picture and examine it for detail. This was done and what I found was when this image becomes black and white, you can still see the object clearly defined and make out its shape, which if it was due to light refraction should not be clear. Upon inverting the image, making a negative, I can see that this was not painted in and the face still holds its definition and clarity, pixels do not blur. WHat this means is that this image was not tampered with and whatever that little "devil" or "demon" is, we just do not know. However, I noticed that the face is very similar to masks worn by the Zuni and Hopi Indians of the american southwest. It almost reminds me of the stories of the little men who lived in the mountains and who the zuni indians knew about and at times battled! THe doglike face with the lizard like body is a close description that Coronado's men gave when they encountered strange craetures who attacked their cattle in the 1500's. (see EL Chuppacabra page under vampires on this site). Bravo Curtis for sending this to us! While I cannot say conclusively what it is, I can say that it is real and not fake. If you have a real picture of something paranormal and want us to examine it, please email us and if it is real we will let you know!